Congratulations to the ProKick team who move up a level on the kickboxing ladder of excellence today 28th May 2017. ProKick's was for our New yellow & Orange Belts. A grading is when Kickboxing students, non-contact and contact, are assessed through a series of levels / grades, with the base level being White Belt, through ten levels, finally reaching a Dan grade at black belt, which is equivalent, if you like, to a degree level in KickBoxing. This type of achievement would take, on average, between six and eight years with a training regime of on average of three to four times a week. 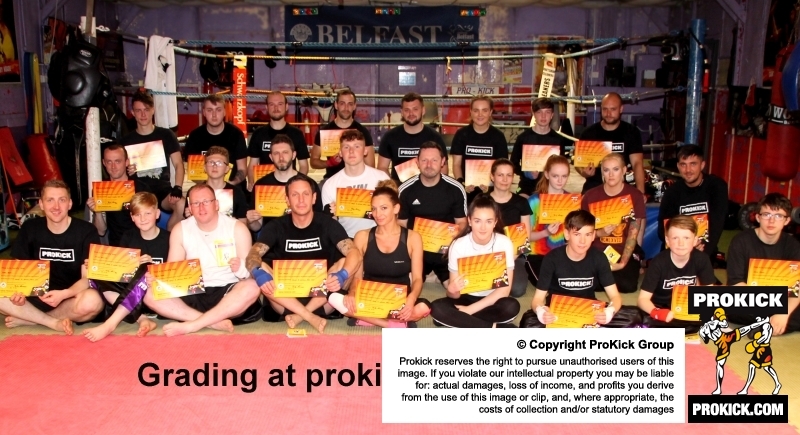 BELFAST ProKick Gym Sunday 28th May 2017 - It was a special grading day for a selected few at the ProKick school of kickboxing excellence - it was graduation day for some of ProKick's enthusiastic Kickboxing students. The new Belters from beginners up to Orange belts move up the ladder to the next level, as they went through a series of tests covering different aspects from the sport which helped elevate most to the next level. 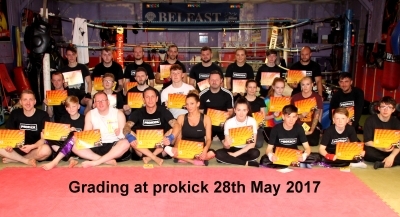 The pressure was on at the ProKick Exam, as the search for kickboxing excellence continued at Northern Ireland’s top kickboxing gym. There will be more photos posted in the gallery from today’s grading in the coming days. Check the time class schedule for your new appropriate class. If the class times do not suit please revert back into your old slot and speak to Mr Murray about alternative class time times.